Schroon Lake, Martha W. Stumpf, 95, passed away July 30, 2018 after an extended illness. Martha was born In Palisades Park, NJ Feb. 22, 1923 and resided there until moving to Schroon Lake March 1, 1991, she was the daughter of the late Herman and Christina ( Hellwig) Stumpf. After graduating from Leonia High School she worked as a telephone operator, than with the War Dept. in Statistical Control, before working with Word of Life Fellowship in NYC for nine years as Secretary/bookkeeper and assistant office manager.. She left there to become a Registered Nurse and teacher. She graduated from Englewood Hospital in Englewood , NJ. and then received her Bachelor's degree in Bible/Nursing at Providence/ Barrington Bible College in Providence, RI. She also received a teaching degree at Jersey City State College in NJ. She was a school nurse and teacher at Haworth Public School In Haworth, NJ for 26 years before retiring to Schroon Lake. 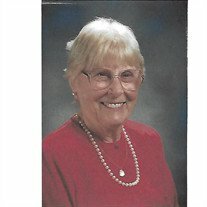 Martha was affiliated with Central Bible Chapel in New Jersey for 57 years and then with Mountainside Bible Chapel in Schroon Lake.She was a member of the NJ Retired Teachers Association, The National Retired Teachers Association, American Nurses Association and she sang with the Ted Cornell Chorale for over 15 years. She traveled to many parts of the world, enjoyed crafts and out-door activities including climbing 13 of the Adirondack High Peaks. Interment will take place at 11:00 AM Friday August 3, 2018 in the Severance Cemetery. Martha requested that memorials take the form of donations to Mountainside Bible Chapel or the Word of Life Student Fund, Schroon Lake, NY 12870.